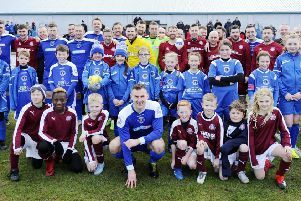 Linlithgow Rose switch focus to the cup on Saturday when they travel to face Lochee United in the East of Scotland Cup third round. Rose head into the match boosted by two fine 4-1 league win over Broxburn and Camelon to put them within a point of leaders Bonnyrigg, albeit with a game more played. But the title race will be put to one side on Saturday as Mark Bradley’s side chase a place in the quarter-finals of a competition they last won in 2010. Bradley is wary of the danger posed by a Lochee side out to bounce back from their Scottish Junior Cup semi-final defeat by Auchinleck. But with the league still - in his words - “Bonnyrigg’s to lose” he knows the trip to Lochee could be his side’s best route towards potential silverware. He said: “It’s Bonnyrigg’s to lose, they’ve got the cushion and they’re on a good run. “They’re the team who did the business earlier on and if they can keep it going it will be theirs. “We’ll just keep taking it a game at a time and see what happens in the next six games. “Lochee will no doubt try pick themselves up and we’ve got to be ready for it. The winners of Saturday’s tie host Tranent in the last eight. Linlithgow are also still in the Fife & Lothians Cup with a quarter-final at Arniston Rangers to come.